2017 was a successful year for island fox pups! In May, the Island Fox Conservation Working Group gathered to report on the status of island foxes across the Channel Islands. The population numbers reported here reflect the annual counting effort from late summer/fall 2017. 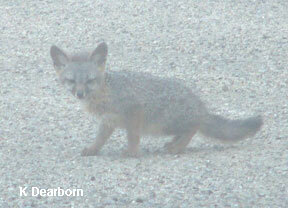 Land managers are currently in the field counting island foxes and providing health evaluations. For most islands, the spring rain in 2017 resulted in greater pup survival and higher population numbers. The larger islands, Santa Rosa, Santa Cruz, and Santa Catalina, all documented population highs. 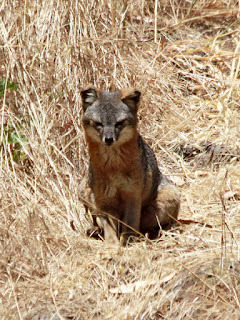 The larger islands have greater plant diversity and therefore a greater variety of food resources for island foxes. Along with these higher population densities (more foxes per kilometer) come increased concern for problems brought to the islands from the outside world: introduced disease and introduced parasites carrying disease. While the four island fox subspecies that were close to extinction in 2000 have all recovered, higher density means disease can spread more rapidly through a population. On Catalina, serology testing in 2015-2017 revealed canine Adenovirus (CAV-1) marching across Catalina within months. This virus causes "kennel cough" and canine hepatitis. 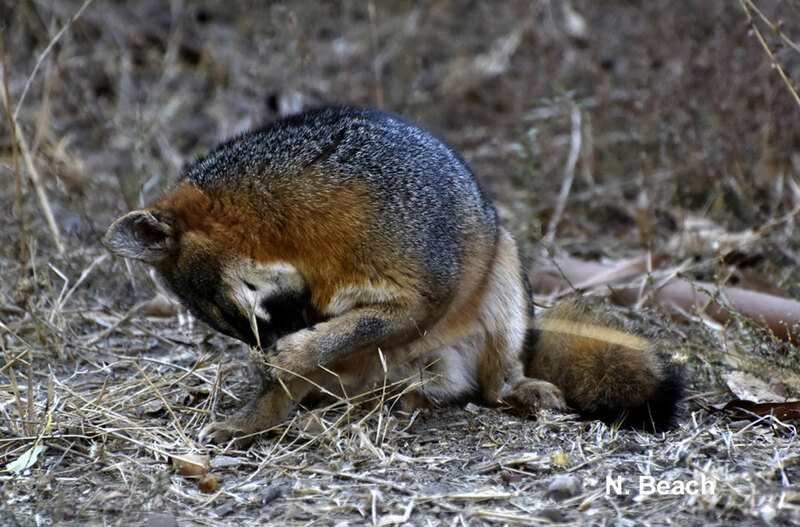 Fortunately, there have been no identified island fox fatalities from the disease, but it demonstrates the fragility of these isolated populations. Across the islands ectoparasites, parasites that live on the outside of the fox's body, have been increasing in drought years. Some islands have had more problems with fleas and lice, while others have seen increases in ticks. This past year, two tick-borne diseases were identified for the first time on Channel Islands; Lyme disease (Borrelia burgdorferi) was found on both Catalina and Santa Cruz Islands and a related disease, relapsing fever (Borrelia miyamotoi) was identified on Santa Rosa Island. Both diseases are known to impact dogs and humans. Understanding the extent of these tick-borne diseases is a priority. Ticks are being collected from island foxes and pathology will need to be run on tick specimens to determine if they carry these or other viruses. What is the extent of these diseases in the tick population? How has island wildlife been impacted? Pathology runs $15 - $50 per tick depending on the necessary tests. Friends of the Island Fox is committed to helping land managers with this new cost. Understanding the disease threat in the tick population is vital for island fox survival and human health. Parasite testing and serology have become a new focus in 2018. The smaller islands face more immediate challenges and population volatility. San Miguel Island ~ 260 foxes (low of 15 in the year 2000) - The population has recovered from extinction threat and is trying to stabilize. Concerns: Drought impact on food resources and an increase in life-threatening parasites. (see Island Fox Update 2018 above) Research is needed to understand how a new parasite is accessing the fox's diet. 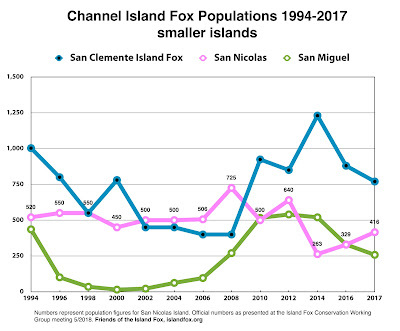 San Nicolas Island ~ 416 foxes (low of ~250 in the year 2015) - The dramatic decline on this Navy island, which began with the drought in 2013, seems to be stabilizing. More pups survived in 2017 and there were fewer emaciated individuals. Efforts to re-establish native vegetation may be providing more direct and indirect food for island foxes (for more see Island Fox Update 2018 above). Concerns: Parasites may have added to poor health in some individuals. A return to drought conditions could further challenge this island. 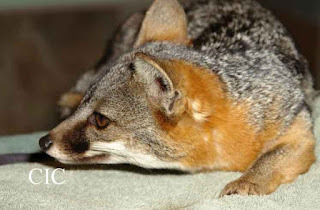 The larger islands have greater biodiversity of plant and prey species to support island foxes and enable island foxes to adapt to challenges, like changing climate. This is an important conservation lesson: habitats with reduced natural biodiversity are less likely to offer survival options when challenged by negative pressures. 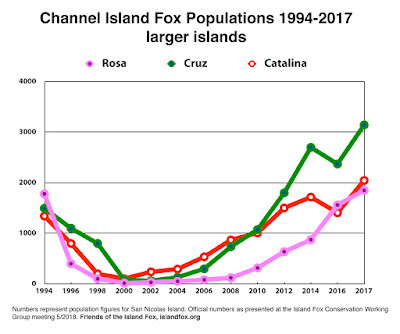 Foxes across the larger islands did very well in 2017 (see graph at top of story). Santa Rosa Island ~ 1,850 foxes (low of 15 in the year 2000) - The population has recovered from extinction threat and continues to thrive. Concerns: Tick-borne disease and an unusual fatal parasite, Leptospira, have been introduced to this island (see Island Fox Update 2018 above). Research is needed to quantify the threat to island foxes and people. 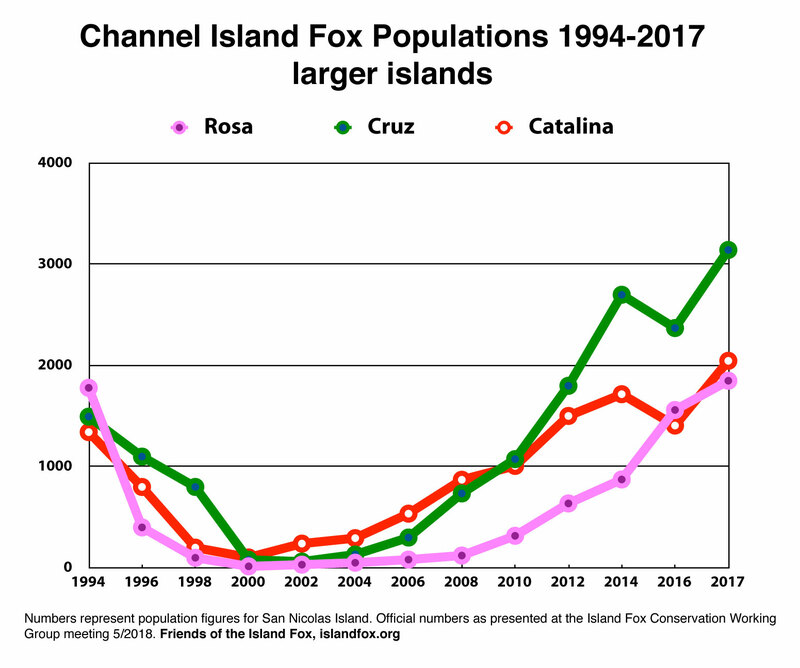 Santa Cruz Island ~ 3,150 foxes (low of 80 in the year 2000) - In 2017, Cruz was home to the largest known population of island foxes ever recorded. Concerns: Tick-borne Lyme disease was introduced to this island. The introduction of other diseases is a major concern (see Island Fox Update 2018 above). 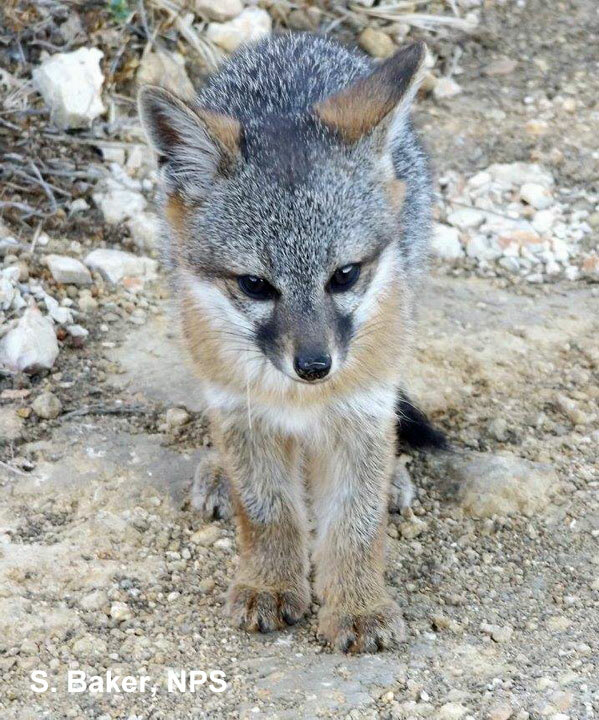 Santa Catalina Island ~ 2,047 foxes (low of 103 in the year 2000) - In 2017, Catalina reached it's highest recorded island fox population. 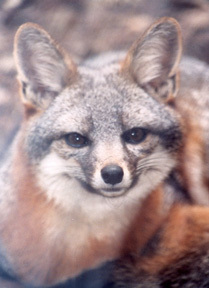 Fox saver bins and road signs are reducing island fox deaths from car strikes. Concerns: Tick-borne Lyme disease was introduced to this island and the threat from human impacts (introduced disease, cars, and aggression from pets and feral animals) is greatest on this island (see Island Fox Update 2018 above). Successful reunion of an island fox pup and its mother. 2017 was a successful year for island foxes, but all land managers agree: Lower rainfall in 2018 may reduce resources leaving island foxes with less support for this year's pups. Even the larger islands may have reached or be reaching carrying capacity - the greatest number of individuals that can be sustained in a habitat. Population numbers are not expected to increase in 2018. Friends of the Island Fox continues to support important conservation efforts for island foxes: radio-monitoring collars, vaccinations against canine distemper and rabies, ID microchips, blood testing for disease (serology), and items that reduce human impacts "Fox-saver" bins and road signs. 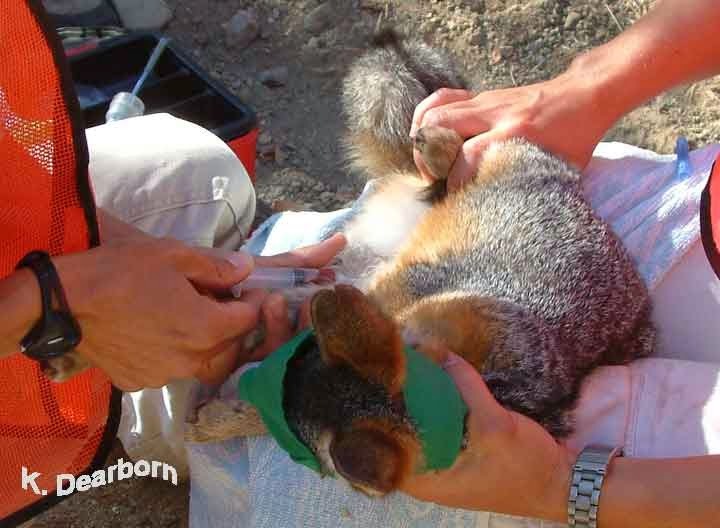 Tick-borne disease is a new and potentially long-term threat to island fox survival. The sooner the threat can be understood, the better the outcome will be for island foxes and people.